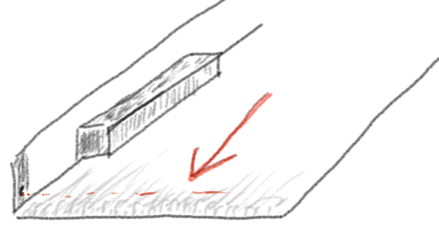 When shopping in my local supermarket I always wondered about one thing at the checkout: The cashier was always pushing one of these separation-bars back, along the movement direction of the conveyor belt. It seemed tedious: after a few movements of the belt the separation-bar was at the belt’s end and was pushed back again. So I asked why. It turned out is it a little hack: The conveyor belt stops automatically, when something passes a light barrier. Probably this is implemented in order to make moving the belt easier (no need for finding a good point to stop); it will prevent as well that items get accidentally pushed on the scanner. However, the light barrier is not very reliable. To assure that the barrier is triggered the cashiers use a plastic separation stick that assures blocking the light barrier. When it blocked the light barrier, it is pushed back again. A nice example how people overcome insufficient technology with a simple but effective solution.